The Mahlke Chronicles: The End. We have finally reached the end of the alphabet! We have gone through it twice now, and I'm a bit relieved to conclude our alphabet projects this week. We will resurrect them again once Ashton is old enough, but now we will do random projects as our moods strike, and that's just fine with me. Rolling the balls to make zebra stripes. Our last letter project centered around zebras. We first had to do a little research on the subject, so we hopped on the internet and ended up on the National Geographic website. We studied more than just zebras and got a bit distracted by the other animals. Eventually we did end up admiring the black and white creatures, though. Our project was to make zebra stripes on a piece of paper. Since we don't have marbles, we improvised and used bouncy balls instead. We dipped the balls into some black paint and then rolled them around inside a box lined with a white piece of paper. This is an idea we stole from ECFE, so it wasn't a new and interesting project to Spencer. He still enjoyed it for a few minutes at least. Once the paint was dry, I cut out the Zs for our last flashcard to complete the pack. While we were looking through the stack of flashcards, we came upon the glitter on the Gg and Spencer decided he wanted to play with glitter. I'm not the type to discourage projects, so I rushed to get all the supplies before my fickle toddler changed his mind. We made a few pictures with good ol' Elmers glue and glitter. The finished flashcard alphabet book. 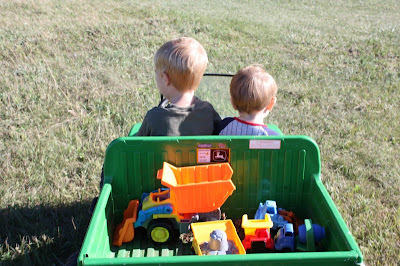 Last weekend we made a trip over to Grandma Amy's and Scharmer's for some tractor fun. 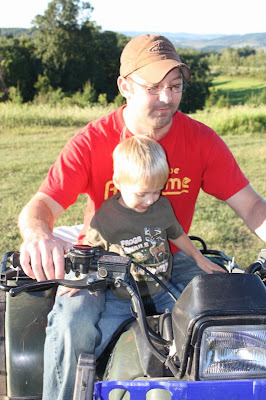 Ashton got his first experience on a tractor and he loved it! We strapped him into the Gator and Spencer drove him around. Watch the video and see for yourself. Otherwise enjoy the pictures below. All week long we've had swimming lessons. The time of the lessons are a bit tricky since they're at 6:15. The boys and I met Dave in Winona for supper each night before class. We had a few picnics, ate at Taco Johns for their Taco Tuesday special and had a special birthday supper for Spencer at McDonald's. Spencer has done two sessions at the YMCA and this is his second at the aquatic center, but this is Ashton's first ever swimming lessons. He's a regular pro! The kid is either fearless or oblivious. He crawls right into deep water, arms a-splashing, until he sinks and goes under. He isn't deterred, though. Nothing deters that kid! Waiting for swim lessons to start. I'll post a special birthday blog later, but in the meantime enjoy more random pictures from our week. Spencer found "Ashton's pillow" (aka the boppy) and decided to snuggle up while watching Mickey Mouse. Playing Choo Choos in the garage. Ash will actually drink breast milk out of a straw! It only took 9 months to discover a way for him to drink it! Now hopefully this means I can get away for more than a few hours at a time now. Spenc said he didn't want the sun to get him (the exact same thing I say when applying sun block so he won't fight me on it). Ash has discovered the stairs. Lord help us all! Pedaling the mail home in his basket (with balls, too, of course). Trying to nurse before swim lessons one day proved to be too tricky of a task. 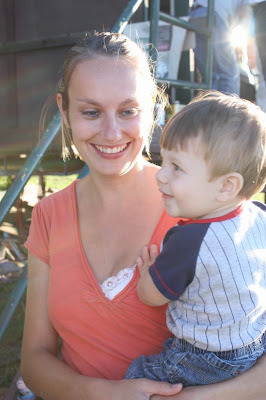 The kid is distracted by everything! He even managed to move my seat!